A thousand? Ten thousand? One hundred thousand? Its actually $2,110,100. That was the figure that a Chinese investment fund manager won for a chance of a lifetime to have lunch with billionaire Warren Buffett. The bid of $2.1 million is the most expensive charity auction on eBay. Zhao Danyang, of Hong Kong-based Pure Heart China Growth Investment Fund, won the auction, which ended on Friday evening with a bid of $2,110,100. 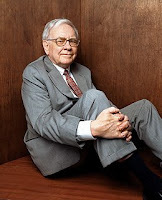 Zhao and up to seven friends will lunch with Buffett, the 76-year-old chairman of Berkshire Hathaway Inc, at the Smith & Wollensky steakhouse in New York City whenever the two men can schedule it. The five-day online auction ended on Friday night on eBay Inc's website. After starting at $25,000, a battle broke out between two bidders in the final stretch, with bid prices jumping seven-fold in two hours. This would have to be the world's most expensive lunch. So much for a happy meal from McDonalds.